On a trip to Houston I lost the cover to my roof rack it had flown off. I went to the dealer to order a new part and paid for it. I latter learned that it was covered under my warranty. I learned because I called the dealer whom I bought the car from. When I went back today to pick up the part I asked to speak to Todd Ryder but he would not speak to me. Then someone else stated that it had not fallen off in 19,000.00 miles that it could not happen. They would not even look at it. I was not refunded my money nor would they even put the part on for me. I will not ever return to van-trow. I will make sure I tell everyone I know how horrible they are. 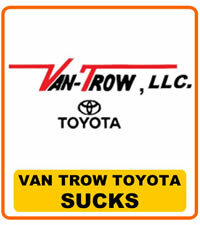 Toyota makes a great vehicle but the people you have working for you are disgrace.